***SERVICE HISTORY*** 1st @ 8,727 miles Mercedes-Benz, 2nd @ 14,592 miles Mercedes-Benz, 3rd @ 20,345 miles Mercedes-Benz, 4th @ 53,178 miles Mercedes-Benz, 5th @ To Be Carried Out - Reyland's Mercedes Specialist. This SLK has the highest of specification including auto gearbox with paddle shift option, VERY RARE PANORAMIC ROOF, 18" 5 spoke AMG alloy wheels, SAT NAV prepared, Day running LED lights, black leather seats with red stitch detailing, RED SEAT BELTS, brushed aluminium trim, Very Rare Clock on Dash option, radio/cd/aux connections, heated seats, air scarf, hands free telephony, black leather flat bottom steering wheel, eco mode, traction control, multi function black leather steering wheel, cruise control with limiter,climate control + air conditioning, fully electric convertible roof + rear wind deflector, heated rear screen, "ECO" start/stop driving mode, remote locking with x2 keys, radio/cd ,electric windows, electric mirrors, auto lights, and stainless twin exhaust exits, multi airbags and AMG floor mats. 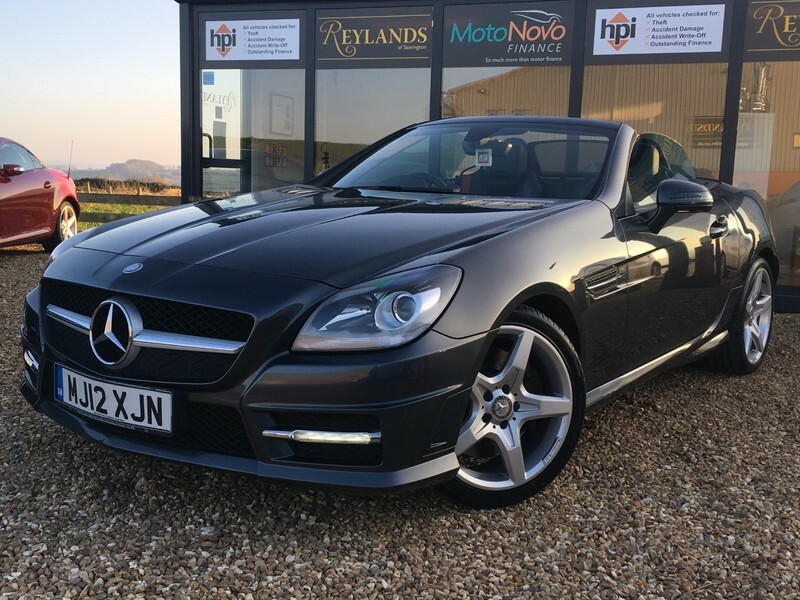 Reyland's recommend early viewing on this SLK due to high spec, petrol engine and very rare colour combination making this SLK stand out from the rest!! Reyland's are Mercedes-Benz Specialist's please visit reylandcarsales.co.uk. Reyland's are located in Seavington, Nr Ilminster, Somerset, TA190QB.